You get a lot of value with the Generac 6438 generator. A power outage is something no one wishes to experience, but unfortunately they can occur at any time, sometimes without warning. With the advanced technology behind a standby generator, you don’t have to ever worry about another blackout. It is recommended by professional technicians and home development experts for homeowners to invest in a dependable standby generator such as the Generac 6438. This guide should provide some valuable information if you’re unsure about purchasing one of these units. It’s a considerable investment so I’ve answered some commonly asked questions on standby generators including my review on two very highly rated models, the Generac 6438, the Generac 6551 and the Generac 6729. Includes: 200 Amp transfer switch, evolution controller & composite mounting pad. Why Should I Invest in a Standby Generator? A standby generator, sometimes referred to as a whole house generator, offers an immediate solution in the event of an extended power blackout. These generators are equipped to be installed permanently near your house, unlike a portable generator. They are capable of providing uninterrupted power for days or even up to a few weeks! A power outage can interrupt your routine and can even pose a serious health threat under some circumstances. In the case of an abrupt power blackout, a backup generator will pick up and supply power to your whole house instantly. It is linked directly to the electrical panel of your home to switch automatically when power fails, even when you aren’t there. If your home experiences a blackout while you are away, you won’t have a refrigerator and/or freezer full of spoiled food and an uncomfortable, not to mention smelly, environment to return home to. Check the generator immediately after receiving for any damage. An additional benefit that homeowners may be unaware of when installing a standby generator is the increase in value to their home. Adding a permanent generator can increase the return on investment to your home by as much as 5% if and when you are ready to sell it. Standby generators are also safer for your home and your appliances. When connected directly to the electricity panel, it prevents electricity from feeding back to the grid. This can be a very important factor when operating sensitive appliances. Once power has resumed, the generator will automatically shut off without any additional legwork on your end. A standby generator is designed to power your entire home. Some whole house generators can cost well over $6,000 per unit (this is an average) to as much as $15,000! This is one factor that makes the Generac 6438 more appealing as an affordable solution capable of providing sufficient power where you need it. It’s hard to argue the benefits that owning a generator can provide, but at the significant cost difference between standby units and portable units many homeowners may be wondering if buying a standby is worth the higher price tag. A portable generator is useful for events like camping or occasional use, but they are not very practical for extended periods of use. Portable generators are limited in how many appliances that can run on the unit. They also require a heavy-duty extension cord to plug in your appliances, because the portable unit must be kept outdoors in a well-ventilated area. Video | How Does A Generac Generator Protect You? An average of 70 million people experience a blackout that lasts longer than 24 hours in the course of a 2-year time frame. Portable units will run for several hours, but will require frequent refueling depending on the power consumption and length of time it is run for. An automatic backup generator will provide dependable backup power for days on end without having to worry about refueling. Automatic backup generators can be powered by natural gas, diesel, or liquid propane as an alternative fuel source to gasoline. How Do Backup Generators Work? What makes a backup generator unique is its mechanism. 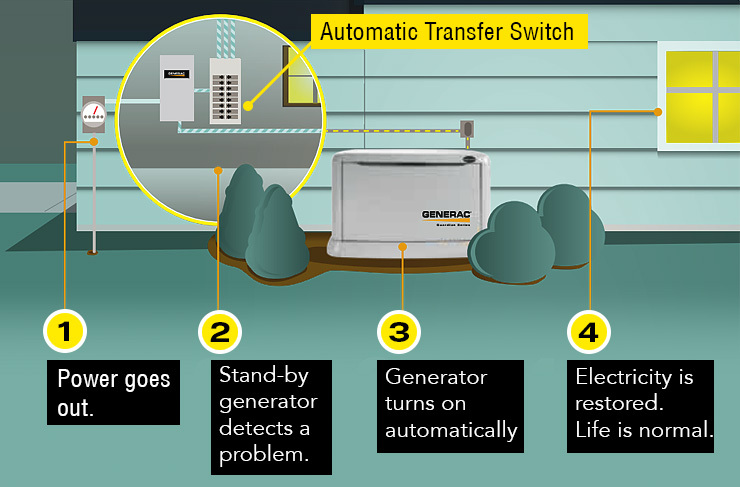 One common feature of automatic backup generators is the auto transfer switch. This will automatically disconnect from the electricity supply when it senses a service interruption. After disconnecting, the generator then transfers its power to the electrical panel. Visit the Generac site to learn more about their generators. There is an internal combustion engine inside the generator, which is filled with natural gas, diesel or liquid propane. This auto-switch occurs without interruption and you likely won’t even notice when the power has failed. Once electricity resumes, the auto-switch will shut down the generator and link the house back to the utility. That is why the backup generators are highly valued and worth investing. When looking at generators you will see them listed as either air-cooled or liquid cooled generators. This refers to the engine. As the name implies, an air-cooled generator consists of an internal fan that forces the air for the purpose of cooling the engine to prevent overheating. Liquid cooled generators are generally seen in units that have a higher kW (over 22kW) using liquid anti-freeze to avoid overheating. These larger units, surprisingly, operate quieter in comparison to smaller kW standby generators, but they are also much more expensive. A standby generator offers many advantages and peace of mind; however it is of utmost importance that they are installed properly. It’s advisable to hire an expert to assess the installation logistics, in addition to the load needs of the generator. Some models including the Generac 6438 in the Guardian Series that Generac offers come pre-wired to make installation easier so you can do all of the pre-installation steps yourself, but when it comes to the electrical and fuel connections, leave it to the professionals. *If you want to watch more, visit youTube and see Part 2 and Part 3. For your own safety as well as others such as lineman, a licensed contractor should do the final installation to ensure that it is up to the electrical codes in your area. In fact, some manufacturers may void the warranty on the model if it has not been installed by a professional. If you consider yourself skilled and are considering installing it yourself, be sure to refer to the warranty details first. The installation of this product must comply strictly with applicable codes, standards and regulations. this product can be installed the homeowner. However, if you are uncomfortable with the skills or tools required, have a qualified electrician or contractor perform the installation. My recommendation is to hire a professional technician unless you are one yourself. Spend the money and have it done correctly. Standby generators are complicated and you don’t want to take any chances with the installation. Please, take my advice on this point. 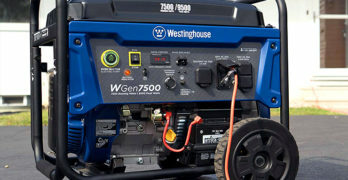 One of the things you will need to keep in mind when purchasing a generator is the upkeep it requires. Generators are machines that will need regular maintenance to keep them functioning sufficiently. For instance, all generators will need to have oil and filter changes done periodically, just as a car engine requires. Because standby generators are consistently running, it is advised to have them serviced on a schedule as specified in the user manual for the model you own. Considering the cost of a standby generator it is certainly in your best interest to have it regularly maintained for long lasting quality. A unit that has been adequately cared for can last up to 20 or even 30 years. A whole house generator is much larger than portable units and will require adequate space for installation. Standby generators are typically installed on a concrete pad or gravel similarly to an outside central air conditioner system. Keep in mind the amount of space required for the generator size you are having installed. Ample space will also serve to boost the performance of your generator. Standby generators come in different sizes and the size your home will require to supply power will be determined on several factors. Such aspects like the size of your home, in relation to the use of appliances and electronics in the house, will need to be factored when making this decision. If you rely on a lot of electronic devices, especially those that utilize a great deal of power, you will likely need a larger unit. Ideally, an average home should pick a generator that ranges between 7,000 to 11,000 watts. However, this still depends on your needs as well as the size of the house. We’ve covered this topic in great detail in the past, so I recommend reading : What Size Generator Do I Need? Can be installed as close as 18” from the home’s exterior wall. Refer to MANUAL. Powerful enough to backup a 3-ton air conditioner, well pump or water heater, and the main rooms of your house. Plenty of power to keep your home and family safe during unexpected power outages. A smart investment if you like to be prepared for the chaotic nature of the world we live in. Unit runs on natural gas or liquid propane. Clean energy will safely power sensitive electronics. Includes automatic 200-amp Smart Transfer Switch (NEMA 1, indoor rated only). 11,000 Watts : UL, CUL and EPA compliant for safety. 2-year limited warranty and is CARB Compliant. OHVI engine: Specifically designed for generator use, provides the reliability to power through the most severe outages. True Power Technology: less than 5% total harmonic distortion means clean, smooth operation of your sensitive electronics and appliances. Evolution Controller: Multilingual, two-line LCD text display with color-coded, backlit buttons. Certified for 18″ Installation to the Home. Versatile: Can operate on natural gas pressures of only 3.5” of water column. Tool-less Fuel Conversion: Switch between natural gas and Propane in seconds. No tools required. Quick, Quiet Exercise Test : Self-test runs for only twelve minutes. Choose your schedule – weekly, bi-weekly or monthly. Mobile Link cellular remote monitoring system. Full Customer Support — non-stop, 24 hours a day, 365 days a year. ✓ View or download the SPEC SHEET for the Generac 6438 standby generator. With many generator brands and models on the market, Generac is a leading brand in the backup power industry. The Generac 6438 11kW air-cooled generator is considered one of the best for the homeowner with average electricity consumption. This generator offers automatic power backup that is reliable, comfortable, and safe to power up nearly everything in your home. It can be connected to your current natural or LP gas supply and it picks up in a matter of seconds for hands-free operation. An LCD multilingual display with a built-in hour meter allows you to monitor and manage functions. High performance, air-cooled, gas motor. Easily select Natural gas or LP gas. The Generac OHVI engine will supply power for weeks uninterrupted with the automatic 200-amp transfer switch included. You can pre-select specific circuits you want the generator to run or the whole house. A waterproof steel enclosure adds protection during storms for long lasting quality. An aluminum enclosure is also available for those who live in areas where salt-air is prevalent such as near the beach. One of the beauties to this 11kW standby generator can make a big difference for those who live in areas with low natural gas pressure. It is rated to operate on as little as just 3.5” of water column. Another notable feature with the Generac 6438 is it’s certified for safe installation as close as 18” to your home (away from windows, entryways, and fresh-air intakes) and it is also CARB compliant. The dimensions of the generator are 48” (L) x 25” (W) x 29” (W) so keep this in mind to allow ample space around the generator for adequate air intake. all-weather, metal enclosure intended exclusively for outdoor installation. A battery is required, which is not included with purchase, to operate the electrical internal functions such as electric start. The battery specs you will need for the Generac 6438 is : Group 26R, 12V, 525 CCA (Minimum CCA). View or download the SPEC SHEET. View or download the MAINTENANCE SCHEDULE. View or download the INSTALLATION STEPS. Air Cooled. Includes: 200 Amp transfer switch (PDF Spec Sheet). Less than 5% total harmonic distortion. Clean power for sensitive electronics. The Guardian series is designed for homeowners. There’s a size for everyone, ranging from 8,000 watts to 22,000 watts. One of the best things about this line of home generators, besides the great engineering is the fact you get around the clock support — 24 hours a day, 7 days a week. Generac’s New Smart Circuit Standby Generator System restores power to your entire electrical panel automatically. Digital Power Management (DPM) protects against overload. Generac Smart Switch (RTSW200A3 – Included). DPM technology allows for the smart control of 4 air conditioners. Service Rated ATS: Mounts between meter and main service panel. Generac OHVI Air-Cooled Engine. Full pressure lubrication system w/ 2 year oil change interval 12″ flexible fuel line and manual included. 5-Year Limited Warranty, plus full support, 24 hours a day, 7 days a week. View or download the SPEC SHEET for the Generac 6551 Standby Generator. View or download the SPEC SHEET for the Generac 6551 Transfer Switch. This model is the industry’s largest air-cooled generator for home use to provide unsurpassed power at the lowest price per kW to give homeowners an affordable advantage. The 22kW standby generator will run up to a 5-ton air conditioner, heat pump, and your appliances without interruption. The corrosion-resistant aluminum enclosure can withstand winds up to 150 mph and it comes equipped with a pre-attached mounting pad. It also performs a self-test according to the set schedule to ensure it is running sufficiently to provide reliable power in a blackout. This self-test is performed in under 12 minutes and is super quiet. The required battery (not included) for the Generac 6551 is a Group 26R, 12V. This Generator measures the same in dimensions as the 11kW Generator. Generac has a unique feature, True Power technology, to deliver smooth and clean power in both of these models. An added bonus that is available with these models is the Mobile Link compatibility. This allows users to monitor their generator remotely using a smartphone, tablet, or computer. With added value and quality features, these generators ensure they are perfectly capable of withstanding any weather condition. If a problem is detected you will be notified immediately through your mobile device as a means of protecting your investment from potential hazards. Think of a standby generator like an insurance policy; you never know when disaster will strike, but you can always feel covered when you need it. One of the most powerful air-cooled generators on the market today. Generac OHVI Engine: Designed specifically for generator use making it a reliable source of power during a crisis. True Power Technology: Less than 5% total harmonic distortion allows you to run your sensitive electronics and appliances without the worry of damaging them. Safe for all electronics. Certified for 18″ Installation to the Home: Third-party certified to NFPA standards to be installed as close as 18” from the home’s exterior wall, as long as it is located away from doors, windows, and fresh-air intakes, and unless otherwise directed by local codes. Easy Installation: When combined with a Smart Switch, re-engineered connection points, and composite mounting pad that eliminates the need for a poured concrete base (unless specified by local codes), the Guardian Series 20 kW generator is easy to install. In areas with low natural gas pressure, the Guardian Series 20kW generator can operate on natural gas pressures of only 3.5” of water column. All-Weather Steel Enclosure: Powder-coat finish and a Galvanneal steel enclosure is well-suited for all weather conditions. Can withstand 150 mph winds. Tool-free Fuel Conversion: Switch between natural gas and LP fuel in seconds. No tools required. Quiet-Test Mode: Automatic weekly test ensures your standby generator is running smoothly. It runs the self-test at a lower, quieter RPM than standard operation. Can also be programmed to run weekly, bi-weekly, or monthly. Mobile Link Compatible: Remote monitoring system allows you to check your generator’s status using your computer, tablet or smartphone, anywhere in the world. Sold separately. Anytime Customer Support: Generac’s customer care call center — in Wisconsin — provides support any time of day or night, all year long.